With more than 2.7 million people uprooted from their homes, the Lake Chad basin is currently home to one of the African continent’s biggest humanitarian crises. The region is reaching breaking point due to attacks by the Islamic State’s West Africa Province group (ISWAP), also known as Boko Haram, and a strong military response which has been launched to curb the violence. The conflict originally stemming from Nigeria has expanded across borders to Cameroon, Chad and Niger, causing widespread displacement and suffering. Multiple suicide bombings and attacks are now occurring almost daily. Indiscriminate violence perpetrated by armed belligerents from all sides has direct consequences for the already vulnerable civilian population. Falmata, 45, lives alone with her eight children in a refugee camp in southern Niger after having fled her village in northern Nigeria, during a violent attack by ISWAP (Boko Haram). Health center of Ngaroua, 35 kilometres east of Diffa. This is one of the several health facilities supported by MSF in Diffa region. “The violence is only serving to aggravate a pre-existing crisis,” says Isabelle Mouniaman, Médecins Sans Frontières' (MSF) programme manager for Nigeria. Many of the displaced have found refuge with host communities, putting a heavy strain on their already limited resources. There are few functioning health facilities available and insecurity prevents people from accessing essential services. State services, already running at low capacity, as well as agricultural activities and cross-border trade have been dangerously disrupted. Since 2014, around one million people have sought refuge from violence in Borno state in north-eastern Nigeria. The large majority live without sufficient food, clean water or adequate healthcare services. In the state capital, Maiduguri, MSF teams support State Ministry of Health centres in Maimusari and Bolori, providing treatment for malnutrition and malaria and assisting deliveries. In 2015, some 116,260 outpatient consultations were carried out. Last September, MSF also began managing the emergency room in Maiduguri’s Umaru Shehu Hospital, where an MSF surgeon now also carries out trauma surgery—in many cases for people wounded in violent attacks. MSF also monitors sanitary and health conditions in 15 camps that currently house some 100,000 internally displaced people (IDPs), one-quarter of whom are believed to be children under five. In nine of these camps, MSF has trucked in clean water, drilled boreholes, constructed latrines, and installed water pipes and tanks. Since January, MSF has also been running the outpatient clinic in the Dalori 2 camp. Further west, in Yobe state, some 195,000 people have fled violence and have settled in host communities and four camps in the area. 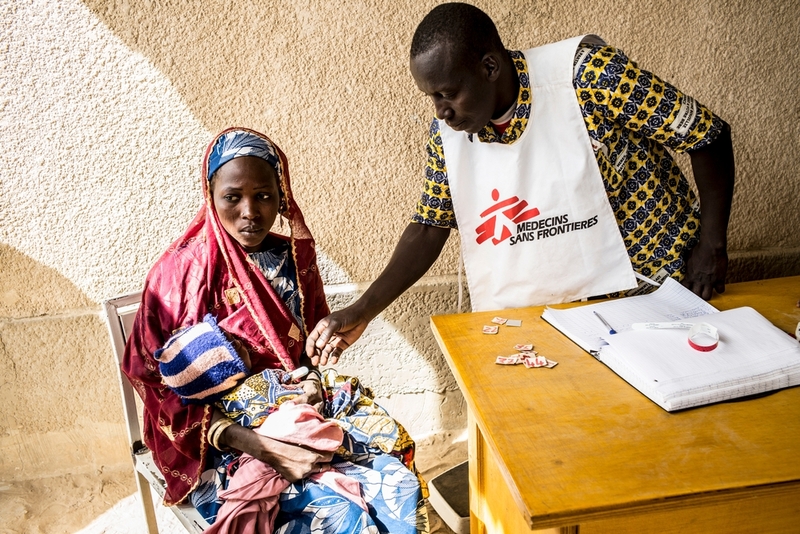 MSF is providing medical care in the health centre in Kukarita. In January and February 2016, MSF teams carried out more than 4,000 consultations there. Last year, 240,000 litres of water were provided every day in the camps. Since February, MSF has started treating children for malnutrition in Damaturu hospital. MSF health promoter in the displaced people’s camp near Baroua. There are currently some 61,000 refugees and 158,000 IDPs and returnees in the Far North region. The majority of IDPs live dispersed in host communities in areas that receive little humanitarian assistance. Since February 2015, MSF teams have been providing essential healthcare services to displaced and local populations in different locations in the region. MSF delivers medical care and water and sanitation activities at the UNHCR-managed refugee camp in Minawao. The camp is situated in a desert-like area where water is scarce. MSF is currently providing some 55 percent of the water in the camp catering for its 55,000 residents. A total of 29,077 consultations were carried out in the camp in 2015, and some 6,861 during the first two months of 2016. MSF is also providing paediatric and nutritional care to the displaced and resident population in the towns of Mokolo and Mora. Around 41,000 IDPs live in the area, but there are few functioning health facilities available. Children under five are treated at the district hospital in Kousseri, where teams also provide surgical support. Around 840 surgical acts, including caesarean sections, were carried out in 2015. MSF has also started providing healthcare services to displaced and host communities in three villages in the vicinity of Kousseri. MSF continues to provide support to local health authorities to help respond to large influxes of wounded following violent attacks. On 17 February, MSF teams treated 75 wounded after a suicide bombing rocked the town of Mémé. Diffa region is only separated from northeastern Nigeria by the seasonal Komadougou river. Around 6,300 Nigerian refugees and 43,800 displaced Chadians are struggling to survive in the face of insecurity in the Lake area. “The situation remains unpredictable,” says Federica Alberti, MSF’s Head of Mission in Chad. MSF has been working in the Lake area of Chad for one year now. Teams based in the towns of Baga Sola and Bol run mobile clinics providing basic healthcare to the displaced and resident populations. In February, teams carried out 6,980 consultations. MSF is also supporting the health centre in Tchoukoutalia. New pockets of displaced people are gathering in Djamaron, north of Liwa, around 100 kilometres from Baga Sola. In February in response, MSF launched new mobile medical activities to reach this vulnerable population. Psychologists also provide mental healthcare in MSF’s mobile clinics as well as in the Dar es Salam refugee camp. In February, a total of 136 consultations were carried out. In addition to its medical activities, MSF is continuing to distribute relief items – in January, teams provided kits containing plastic sheeting, mosquito nets, soap, towels and blankets to some 2,600 people, as well as water treatment kits for 500 families. Teams also supported the local hospital in Mani to treat wounded following a suicide attack on 31 January. In Bol, MSF works in collaboration with local health authorities to provide maternal and child healthcare at the district hospital. RN1 road connects Diffa with Niamey, the capital of Niger. More than 300,000 Nigerian refugees, internally displaced and returnees have sought refuge in Diffa, southern Niger, due to continued violence in the area. People live in very precarious conditions and basic needs such as shelter, food, clean water and access to medical care remain unmet. In Diffa town, MSF is supporting the main maternal and paediatric health centre, providing care for children under 15. In January 2016, more than 146 deliveries were carried out. MSF is working in the district hospital in Nguigmi, and in several health centres in the surrounding area. MSF also is providing medical care and water and sanitation activities in Assaga Camp, which hosts some 12,000 Nigerian refugees, and in Yebi, where some 30,000 people have sought refuge. In 2015, MSF carried out more than 142,000 medical consultations in the region. MSF teams have also conducted a measles vaccination campaign in Assaga Camp, and vaccinated more than 79,000 people against cholera in the district of Bosso.